B-Phycoerythrin Conjugation Kit ab102871 uses a simple and quick process to conjugate an antibody to B-Phycoerythrin. It can also be used to conjugate other proteins or peptides. Learn about buffer compatibility below; for incompatible buffers and low antibody concentrations, use our rapid antibody purification and concentration kits. Use the FAQ to learn more about the technology, or about conjugating other proteins and peptides to B-Phycoerythrin. Amount and volume of antibody for conjugation to B-Phycoerythrin. The selling size of this product has been changed – it is now based on the amount of antibody that can be conjugated with the kit, not the amount of PE mix provided. 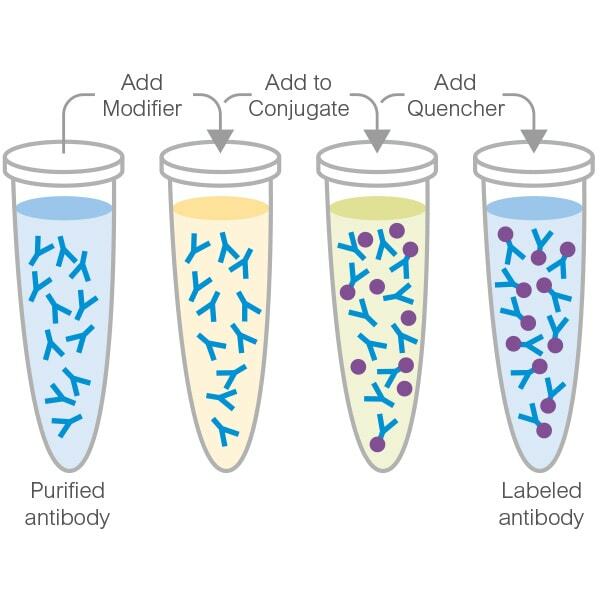 The quantity of reagents provided have not changed or the amount of antibody that can be conjugated. Our Abpromise guarantee covers the use of ab102871 in the following tested applications. We are involved in a study that uses bone marrow stromal cells from goat (BMSC), and we’d need to characterize the cells, by means of flow citometry, against CD-34 and CD-90. Our difficulty is to find a specific antibody, that reacts positively with goat cells. I’ve searcher on several suppliers and only on yours I found a CD-34 with positive reactivity against sheep. Do you know if someone has used it against goat, as goat BMSC are being used on several studies? Would you recommend this antibody: Anti-CD34 antibody [EP373Y] (ab81289), to be used against goat? We also would like to mark the goat BMSCs cells against the CD-90. In your site I did not see a reference to positive reactivity against goat, sheep or cow. Do you know if anyone has used one of the listed antibodies for goat studies, and if they have shown positive reactivity? In case of a positive answer which one would you recommend us? In the case that abcam can supply us with this two antibodies, we would like them marked with fluorescent probes (not FICT or PE, as we’ll combine this antibodies with others we’ve bought a few months ago and that are marked with PE and FICT), which are the possibilities that you offer? Do you have a dealer in Portugal? Frilabo or Alfagene? We currently do not have any publication information regarding its use in sheep BMSCs. I am sorry we can't offer any tested data. This antibody however was tested with sheep lysates and gave good staining so it is more likely that the antibody with detect sheep CD34 target. The use of ab81289 (https://www.abcam.com/CD34-antibody-EP373Y-ab81289.html) comes with Abcam Abpromise guarantee which states we will refund your money if the antibody fails to detect the CD34 target. I can provide further opinion about CD90 antibodies could you send me goat CD90 protein sequence? We do not have distributor in Portugal you can buy directly from us.